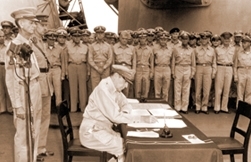 The story of the "world's most famous battleship" is brought to life for students between 4th and 12th grades with a free 30 minute traveling historic presentation. Presenters will share with students a virtual tour of the battleship while painting a captivating picture of the Mighty Mo’s unique history. 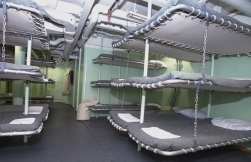 Students will marvel at the sacrifice and resolve of the Sailors who served aboard the ship. 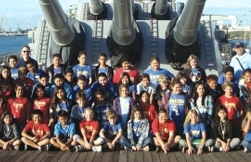 To learn more about the Battleship Missouri education programs or educator resources, please contact our Education Director at (808) 455-1600 ext. 240, Education Assistant at ext. 253, or Education Department or email the Education Department. 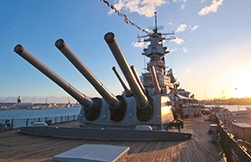 If you are unable to bring your class for a visit to the ship, you can connect with the Battleship Missouri Memorial through video teleconferencing. Bring your school on a virtual tour, and presentation about the history (with emphasis on WWII) of this great battleship, followed by questions and answers about the ship. Contact us today and take advantage of this long distance opportunity.